Today’s AM fix was USD 1,341.75, EUR 971.79 and GBP 827.58 per ounce. Yesterday’s AM fix was USD 1,336.25, EUR 968.79 and GBP 825.76 per ounce. Gold climbed $12.10 or 0.91% yesterday, closing at $1,345.40/oz. Silver inched up $0.11 or 0.49% closing at $22.67. Platinum rose $15.45 or 1.1% to $1,445.75/oz, while palladium fell $0.53 or 0.1% to $743.47/oz. Gold Krugerrands (1 oz) are trading at $1,406.48 or premiums between 4.75% and 5.5% and Gold Kilo Bars (1 kilo) are trading at $44,451.89 or premiums between 3% and 3.5%. Premiums are steady. Gold dipped below its three-week high in London on profit taking after a 2% gain this week, which put gold on course for a second week of higher prices. Gold closed above the 50-day moving average and this in conjunction with two weekly higher closes is bullish technically. Gold’s gains yesterday came due to increasing concerns that the Federal Reserve will maintain the pace of unprecedented monetary stimulus and debasement. Gold is on track for its first yearly drop in over 13 years, as speculators sold gold on the COMEX and some investors became nervous of the recent price falls. Gold is probably at a cyclical bottom and CPM sees gold prices rising sharply in 2016-2023, CPM Group’s Jeffrey Christian said in a speech in Toronto on Wednesday. The call is interesting as CPM have been notoriously bearish on gold in recent years - throughout much of the 11 year bull market. CPM Group sees the gold price at $1,240-$1,380/oz for “most of the next few months,” CPM managing partner Jeffrey Christian said. Gold may trade in a $1,240- to $1,500/oz range for “the next couple of years”. 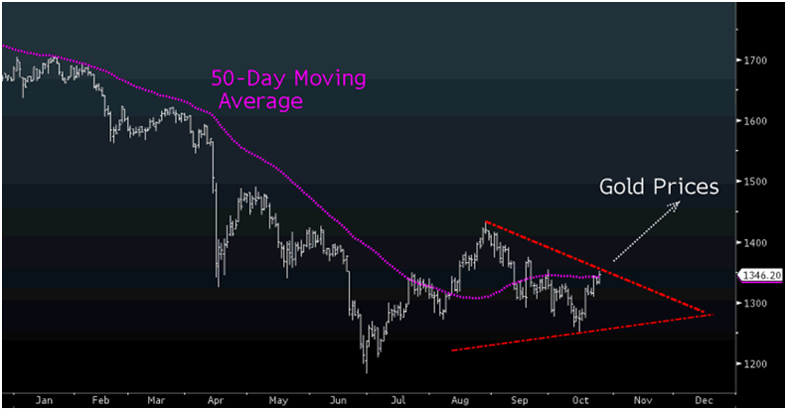 Gold may jump 7.5% or $100 to $1,450/oz by year end if prices break out of a pennant formation, according to technical analysis by Paul Kavanaugh of Future Path Trading as seen on Bloomberg.